What Miami Beach wedding is complete without a great band? 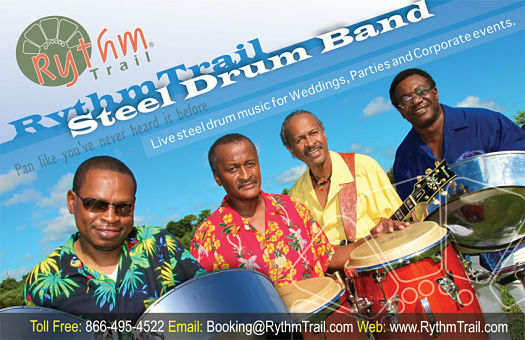 RythmTrail is Florida’s premier steel drum band with over 20 years, experience from real Caribbean islanders. Whether you need a steel drum band to play your corporate event, beach wedding or house party, RythmTrail can provide you and your guests with a memorable occasion in Miami, nationwide and even internationally. Book one steel drum player or an entire steel drum band to play your favorite reggae, soca, calypso and steel drum music or let RythmTrail provide the sounds to set a romantic, festive or even suspenseful mood to suit your occasion perfectly. Let RythmTrail take you away to the tropical islands with their sweet sounds and lively flavor. No matter what the location or occasion, RythmTrail is sure to provide your event or gathering with the best steel drum music for the best price. Whether you need an experienced wedding band in Miami Beach or you need something different for your corporate event, you can count on RythmTrail to make your occasion an unforgettable tropical island adventure. Call us today at 866-495-4522 or visit us online for a free quote and let RythmTrail provide you with the ultimate music for your event. Thank you for making our wedding brunch a great success. Steel Drum Band made the day a party! half an hour later. My guests enjoyed the music, also. I was very pleased with your musician performance and professionalism. We would definitely recommend your services and would love to have you come back on a future date to one of our events. Post by Lindsey Killian Maron. The performance was perfect for our event. Ed was so friendly and kept everything professional and fun-filled as was appropriate. We truly appreciated the entertainment and our customers seemed to love it as well! Dusty was fantastic!! Not only was he an amazing musician and could sing on key but he was on time, courteous and charming. RythmTrail was professional top on the line quality, from the fast email responses, to there contracts, communication, they delivered exactly what i wanted!! They take there clients serious and are a no non sense company!! I shopped around for a steel drum band and i highly recommend them! You will not have ANY regrets!! Our Steel Drum Band will be playing at the Mandarin Oriental Hotel tonight in Miami FL. for a corporate reception. Our steel drum band is playing at a cocktail hour reception today at The Palms Hotel in Miami Florida. The best steel drum players, live island music, background music for weddings, parties and corporate events in Miami FL. Our steel drum band will be jammin in Miami FL today Mar 30 2016 at WFOR-TV news station for staff appreciation day luncheon. Tonight we are jammin at the Fountaine Blue for a Corporate Reception. Book the best steel drum band for wedddings and events in Miami Beach FL. Our steel drum player/soloist will be entertaining in Miami Florida tonight for a corporate reception at Cipriani Restaurant. The best steel drum band and players in Miami & south Florida. Hire for weddings, parties, rehearsal dinner, celebration, community events and more. Where are we playing today Jan 15 2016? Our steel drum players are jammin tonight at Fontainbleau Miami Beach for a wedding rehearsal dinner. Hire the best steel drum music for beach wedding, parties & corporate functions in Miami Florida area.